Contact us, meet with us, get started. 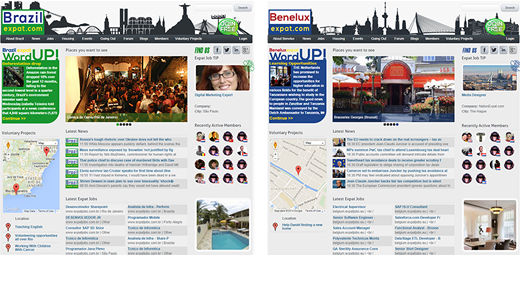 Gather content, start promoting your expat website. Start within days without the need of an investment. The website, technical support, analytic reports and advertisement model. Please visit: BrazilExpat.com to view a live running example. Your country, your exclusive responsibility, your business. To start your own business, just pick one of the countries below and tell us how you want to run your business. You don’t have to do it all by yourself, we provide the necessary information to start, take care of all updates, service, IT-support and the tools to run your own online expat-platform. You take care of the content, the community and find advertisers, leave the rest op to us. Instead of explaining the formula, how about you see it in action for yourself. Please visit: BrazilExpat.com or BeneluxExpat.com. Start within days without the need of an investment. All franchisees pay 25% of their revenue with a minimum that differs per nation. You'll get the whole package: The website, webhosting, IT, technical support, weekly analytic report, design updates, advertisement platform & specifications, SEO optimization and automated feeds. The only thing you have to do is to supply the site with content, build a community and find advertisers. We'll even help you with the most interesting parties you can contact and also work on. For many countries we also own the domain names of the largest cities to prevent local competition, of course these domains will be forwarded to your nation domain. © 2016 NationExpat.com. All rights reserved.